The clinic was struggling with timely processing of lab results for incoming patients. Wait times for lab results ranged from 12 minutes to 75 minutes. The delayed lab work was extending treatment times and causing a logjam in both treatment and infusion rooms as well as the incoming patient waiting rooms. Managers were unsure how to determine manpower needs and struggled to deal with service peaks. The clinic managers had experimented by varying the staff levels within the laboratory with variable results. A Productivity Healthcare consultant first worked with the team to perform 5S on the draw and lab processes to create structure and flow. The team then examined job content using time study techniques to analyze and time draw and lab activities to determine how many people are needed to support patient volumes and desired response times. The diagnostic team convened a rapid improvement event (kaizen) to improve flow and responsiveness of the Medical Assistant’s draw and Lab Tech’s analysis processes. The team learned visual controls from their Productivity Healthcare consultant and created improvements for handling patient charts and blood draws. These improvements resulted in quicker processing times and simpler controls to prevent tests being delayed. A pull workflow process, designed for under 30-minute diagnostics, was created. Work flow analysis led to the creation of role-based job instructions with flow maps and flexible manning based upon expected patient loads. Integrating the changes with their 5S process assured ongoing capability. After the rapid improvement event, the Productivity Healthcare consultant created a draw and lab tech-manning decision model based upon patient volume by appointment type. Simulation modeling was used to determine performance expectations and expectations for lab process response times to assist the clinic director in determining current scheduling and future response needs. Follow-on activity after the rapid improvement (kaizen) included training of new employees at the clinic using role-based job instructions and flow maps. Now staff anywhere in the clinic could see easily what was expected of them, and how their role supported the team. 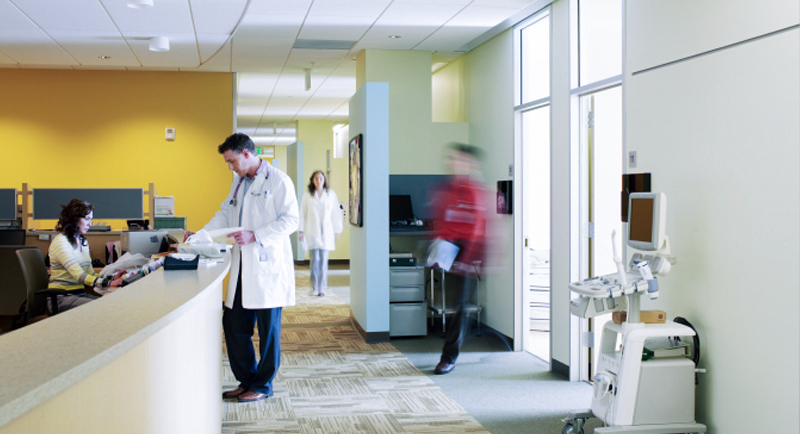 Stability in lab result turn-around times helped smooth clinic patient flow. When integrated with improvements to patient treatment process flows, results were further multiplied. Additionally, nursing turnover slowed dramatically. Clinic throughput improved by 15% without adding resources.